Former Guns N’ Roses drummer Steven Adler will perform the band’s 1987 debut, “Appetite For Destruction”, in its entirety on his upcoming 2018 tour with the resurrected Adler’s Appetite. Adler’s agent – and Quiet Riot guitarist – Alex Grossi shared the news via social media about the group’s return from their 2011 split with word that they are accepting bookings via the BTE Inc. (Bigg Time Entertainment) booking agency for a trek that will see the drummer celebrate the 30th anniversary of the biggest-selling debut album of all time alongside selected Guns N’ Roses tracks. Adler joined GNR in the spring of 1985 and appeared on the group’s debut and 1988’s “G N' R Lies” (as well as “Civil War” on 1991’s “Use Your Illusion II”) before being fired in 1990 for excessive drug use. 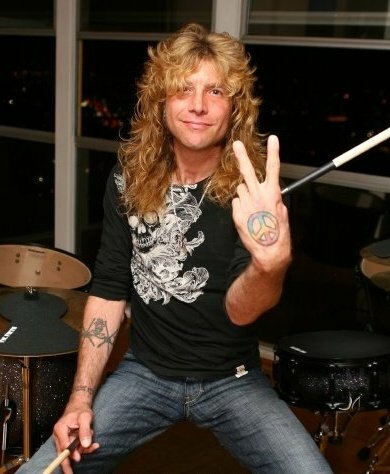 The drummer has long lobbied for a full reunion of the group’s “classic” lineup, and did appear with the trio of Axl Rose, Slash and Duff McKagan in 2016 on Guns N’ Roses’ Not In This Lifetime tour to play the “Appetite For Destruction” tracks “Out Ta Get Me” and “My Michelle” with his former bandmates in Cincinnati, OH, Nashville, TN and Dodger Stadium in Los Angeles, CA, and each song over two nights in Buenos Aires, Argentina on November 4 and November 5, 2016. Guns N’ Roses have extended the reunion tour into a third year with a series of summer 2018 concert dates across Europe that will begin in Gothenburg, SE on July 21.